EZBuy, a Singapore-based online shopping platform, has expanded its services to Pakistan. It is regarded as one of the most popular online retailers in Singapore, and twice as big as Daraz in terms of the number of products offered. 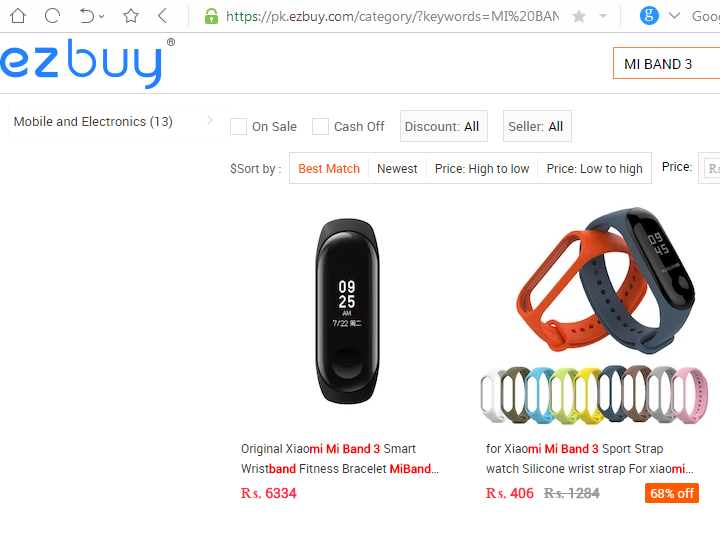 Pakistanis can now order from a catalog of more than 3 million products on EZBuy (formerly 65Daigou), ranging from clothing, electronics, accessories, cell phones and more. Anyone who is familiar with how Aliexpress works can start using EZBuy right away. Like China’s Aliexpress, people can order products from EZBuy and have it shipped to their doorsteps from around the globe. Your orders are shipped from either Singapore, China or any other country where the seller is from. That’s not all that EZBuy offers its Pakistani users. You can set up your shop on the online store and get access to buyers from all around the globe. Another useful feature is that users can buy products in Pakistani Rupees, unlike Aliexpress where you can view the price in Rupees but payments have to be made in US Dollars. EZBuy currently has offices in Singapore, Malaysia, Thailand, Indonesia, and Taiwan. The company has recently opened its office in Pakistan as well. The online shopping platform first came into being in 2010, when a group of entrepreneurs in Singapore brainstormed ways of bringing the online shopping experience for their fellow countrymen. In 2011, the online platform saw widespread success, becoming one of the most trusted names in online shopping in no time. In the later years, the platform first expanded its operations to Malaysia, and then to Indonesia and Thailand in 2015 and 2016 respectively. It built its office and warehouse facility in the aforementioned destinations, making it the largest cross-border aggregator of merchandise in SE Asia in 2017. In March 2016, EZBuy raised a series B round worth US$20 million to expand its operations overseas. Co-Founder Wendy Liu stated that the funds will go towards rebranding the company as a globally recognized brand. As CPEC ramps up in Pakistan, EZBuy saw an opportunity to set up shop here. Pakistan will be the fifth market for the online shopping platform. It is aiming to empower and develop local suppliers while offering various products and services to online shoppers in Pakistan. They just open the office here, they are not planning to making their product here. Good for Online shoppers. May Amazon change its mind as well. @Ammir Atta, you put you’re reputation on the line when you ‘promote’ a business rather than post it as a new article. I ordered from Ezbuy after reading about it here, on Aug 14th. I paid via debit card. The sad new is they haven’t delivered the items I ordered till today, and when I call them they say the minimum delivery time is 45 days and there is no maximum time limit, when I challenged them with “Does that mean it could take a year” the only answer I got was the same one as before, it takes minimum of 45 days and there is no max time frame. The cherry on top was when they transferred me to their manager and she said I never paid for the item and it was cash on delivery… I had to email them proof of payment. If you goto their Facebook page you will see that I am not the only one waiting after payment, Pathetic. It is your responsibility now to blog about this or update this article after investigating further.